Artur Tomasevic (centre) after his win at Felixstowe. Peterborough Police Amateur Boxing Club star Artur Tomasevic made it a magnificent seven wins from seven fights at the weekend. The 17 year-old Peterborough puncher came up against a tough opponent in Essex University champion Jamie Hercus in an 84kg match at a show in Felixstowe and he won easily on points. Both boxers boasted unbeaten records and Tomasevic always looked the more likely to remain undefeated. Tomasevic boxes again tomorrow (May 27) at a show in Bushy and then has his first fight abroad in July when taking part in the Monkstown Cup International in Ireland. 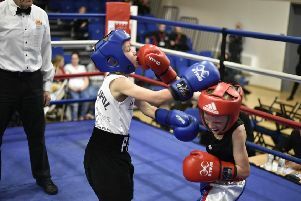 Stevie Winters (11) from Paston got his career off to a winning start when boxing for Peterborough Police at a show in Nottingham on Saturday. The youngster from Paston boxed Muhammed Holmes from the Jawaid Khaliq Boxing Academy and emerged a unanimous points winner. Coach Chris Baker said: “It was a fine performance from Stevie and great things are expected of this lad. He produced some quality boxing and even found time to fit in some ‘Ali Shuffles’, which got the crowd going. Clubmate Muhammed Khan, who was a knockout star the previous weekend when boxing at the Town Hall, was also in action at Nottingham but lost out on points to Abdul Ali from the Jawaid Khaliq club.